to find horse racing selections for further analysis or to bet blind. the profit from that one. of things seem obvious when you know them. are saved for the main season. over the 5 years analysed. So now you have one method that you can use on horse racing. But it also pays to take in other betting events. hundreds that are now available to punt on. wagered is on the outright match win market before the off. edge by betting before the kick off. But in play is a different matter. of things as opposed to the result of bookmakers research. lot of change after the break. 45 minutes, no fewer than 75% of them went on to win the match. Let’s take Spain’s La Liga in 2010/11… the figure was 75%. random stats were similarly solid at 75%. with some sort of ‘Plan B’. is staring them straight in the face. leading at half-time to win the match in the in-play markets. still be more than generous. half-time should be around [1.31] to win. Now many will be shorter than this… but many will also be bigger! methods this knowledge could enhance your profits. keep you in profitable bets. I used back in the 90’s. 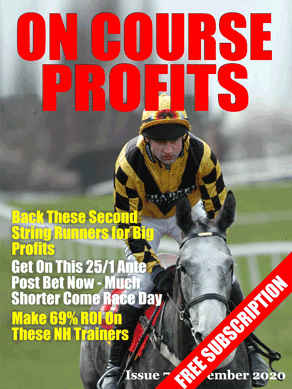 Register Today for our Free Daily Racing Tips from Top Tipsters. Everyday Monday to Saturday we will email you a selection from a Top Tipster. very interesting enjoyed your article. I don’t see that the football stat is particularly useful. If the average odds are 1.31, that gives an implied probability (the percentage you need to win to break even) of 1/1.31 = 76.3%. The chance of it actually happening has to be larger than that to make money. Admittedly, the figure of 78% for the Premier League is larger than that, but you could only make money if your exchange commission was very very low. Perhaps this stat could be used to aid selection in some way, but as a system in itself, the stats predict that you would lose money. What Matthew is saying is that the average odds should be around 1.31 and that if they are higher then you should consider a back bet. Ah, I see. Apologies for my misunderstanding. I left a comment yesterday highlighting this method to use. when you asked about the chelsea vs swansea game. i have used this method for a long time and its great that you highlighted it as pro Sports Bettors. i know i am on the right track! How long have you been using it for? [Free Tip Inside] Would You Like Daily Profits? This site is owned and operated by Blue Delta Marketing Ltd.